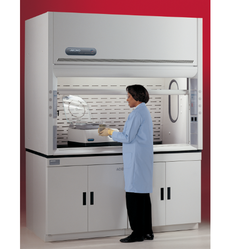 We offer Fume Hoods to our clients at superior range. These hoods are device that is designed to limit exposure to hazardous or noxious fumes, vapors and dust. A fume hood is typically a large piece of equipment enclosing five sides of a work area, the bottom of which is most commonly located at a standing work height. Fume hood maintenance can involve daily, periodic, and annual inspections. These Laboratory Fume Hood are used in different applications like laboratories, research units of industries, institution etc. They are also used in industrial applications or other activities where hazardous or noxious vapors, gases or dusts are generated or released. These hoods are known for their features like non-conductive, chemical resistant, corrosion proof, precision design, accurate functioning. Polypropylene table drain, elliptical shape, round shape and FRP washbasin, drain lines exhausts fan and ducting for fume cupboards, laboratory table top bonded lining with polypropylene sheet etc.